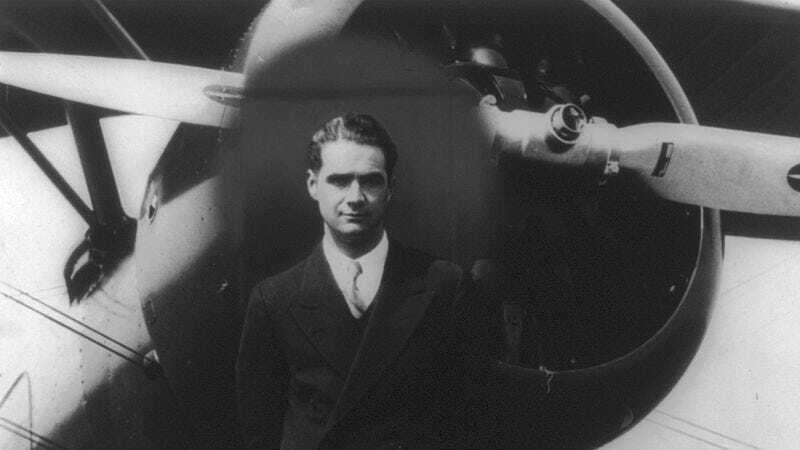 What it’s about: One of the 20th century’s most fascinating figures, Howard Hughes was a tremendously successful businessman, notable for doing well in numerous unrelated areas, including film, aerospace, real estate, and hotels, innovating (and making loads of money) in each. He was a generous philanthropist, supporting medical research after his parents died of an ectopic pregnancy and a heart attack, respectively, while Hughes was a teenager. At one point, he was considered the richest self-made man in the world (although, like most self-made men, he inherited a successful business from his father.) And he dated a parade of movie stars, including Bette Davis, Ava Gardner, Katharine Hepburn, and Ginger Rogers. But Hughes is equally famous for the last 10 years of his life, when chronic pain and obsessive-compulsive disorder turned him into a germophobic recluse. Strangest fact: Hughes started his spectacular career young. He was a technological prodigy, building a radio transmitter at age 11 (the first in his hometown of Houston), putting together a motorized bicycle at 12, and starting flying lessons at 14. He dropped out of Rice University at 18, after his father’s death, and at 20 he married Ella Botts Rice, moved to Los Angeles, and almost immediately found success as a movie producer. Over the next 30 years, Hughes produced 25 films (including the original Scarface), directing two (one of which, Hell’s Angels, was the most expensive movie ever made at the time). His power in Hollywood increased to the point where, in 1948, Hughes took over RKO Pictures. But even as Hughes was a Hollywood mogul, he was also flying and building airplanes, setting an airspeed record of 352 mph in 1935, in his company’s Hughes H-1 Racer, (a record he beat a year and a half later), and piloting the fastest flight around the world three years later. Biggest controversy: Shortly before the 1960 Presidential election, Hughes gave a loan of $205,000 to Donald Nixon, brother of the then-vice-president. After Nixon won the 1968 election, Hughes also gave $100,000 to Charles “Bebe” Rebozo, a friend of the president’s. It’s believed by some that Nixon ordered the Watergate break-in to see if the Democrats were aware of the bribe and intended to use it against him. According to Wikipedia, a former advisor of Hughes, John H. Meier, conspired with Hubert H. Humphrey to feed misinformation to the Nixon campaign, via Donald, who was in charge of “collecting intelligence for his brother.” Apparently, Meier managed to convince Nixon that the Democrats had information on illicit dealings between the president and Hughes (although they didn’t), and it may have been fear of exposure that prompted Watergate. Thing we were happiest to learn: Martin Scorsese’s biopic of Hughes was called The Aviator for a reason. While Hughes was successful in many areas, he was legendary in the field of aviation. He not only flew several record-setting flights, he did so in planes his company built and he had a hand in designing. The speed record he set in 1935 was the last record set in a plane built by an individual; subsequent records have been set by military aircraft. The Hughes H-1 Racer set a speed record the first time it flew; Hughes flew the plane until it ran out of fuel, and managed to crash land without injuring himself or the plane. His first words upon leaving the cockpit were, “We can fix her. She’ll go faster.” Not content to test and fly airplanes, Hughes also bought TWA in 1939 and ran it for 17 years. Not everything Hughes touched turned to gold. In 1943, a friend of Hughes, Colonel Elliott Roosevelt, convinced his father’s administration to build the Hughes D-2 bomber for the war effort. However, the hangar where the airplane was being developed was struck by lightning, and the prototype was destroyed. Hughes’ bad luck continued, when a 1943 test flight of the amphibious Sikorsky S-43 crashed, injuring Hughes and killing his two passengers. Three years later, another prototype, the XF-11 reconnaissance plane, crashed after Hughes stayed in the air twice as long as planned, until the plane started leaking hydraulic fluid and crashed into a house. Once he recovered from his injuries, Hughes flew the XF-11 again, but the Air Force deemed it too expensive to put into production. Hughes most famous aircraft, the massive, mostly-wooden “Spruce Goose” (actually named the H-4 Hercules, and made of wood because of an Air Force dictum to use “non-strategic materials”) was also a failure, after numerous cost overruns and so many delays that the war was over by the time the plane’s development was finished. Despite these high-profile setbacks, Hughes Aircraft’s helicopter and aerospace divisions each became lucrative defense contractors. Thing we were unhappiest to learn: The OCD that dominated Hughes’ later life seemed to be present early on. Even as a young man, Hughes was fixated on seemingly trivial details—one of his favorite foods was peas, but he became preoccupied with sorting them by size. He was reportedly extremely difficult to work for as a film director, as he would get hung up on minute details for long stretches. In 1947, Hughes went to a local screening room and ended up staying for four months straight, watching movies constantly, consuming only chicken, milk, and chocolate, and writing instructions that he was to be neither spoken to nor looked at. However, OCD was not Hughes’ only issue, and may not even be the primary reason for his eventual withdrawl from society. Besides chronic pain from surviving several plane crashes, he also suffered from allodynia, an increased pain sensitivity, which meant that even usually painless stimuli would hurt. This may explain his reluctance to cut his fingernails, and his habit of remaining naked for long stretches. Movies may have been a distraction from the pain, although he also displayed obsessive behavior in his viewing habits: He once had John Sturges’ thriller Ice Station Zebra played in his home on a continuous loop, watching it at least 150 times. Also noteworthy: Hughes had a reputation for eccentricity even before his reclusive later years, but that may simply be because people working for him were eager to indulge their wealthy boss’ every whim. Hughes was fond of banana-nut ice cream, but it had been discontinued by Baskin-Robbins. His staff put in a special order for 200 gallons (the smallest amount the company was willing to produce). A few days later, Hughes decided he was tired of banana-nut and only wanted chocolate marshmallow. One of Hughes’ Las Vegas hotels ended up giving it away free to casino patrons for a year, and rumor has it there was still some banana-nut left in the hotel’s freezer 30 years later. Best link to elsewhere on Wikipedia: One of Hughes’ most enduring contributions to film was producing 1931’s screwball comedy The Front Page, based on a Broadway play about scheming newspaper reporters. The film was nominated for Best Picture, Best Director (Lewis Milestone), and Best Actor (Adolphe Menjou), but is probably best known for its multiple remakes: Jack Lemmon and Walter Matthau starred in a faithful update in 1974, but Howard Hawks’ 1940 version (retitled His Girl Friday) changed the male reporters to ex-husband and -wife (Cary Grant and Rosalind Russell), and their rapid-fire banter is considered the pinnacle of screwball comedy. The conceit worked so well that director Ted Kotcheff kept it when he moved the story to the world of TV in his 1988 remake Switching Channels, with Burt Reynolds and Kathleen Turner in the leads (although Kotcheff’s version was a flop). Further down the wormhole: In the mid-’60s, Hughes moved to Las Vegas, buying the Desert Inn, and eventually several other hotels and casinos. He bought the Silver Slipper casino just so he could move its slipper-shaped neon sign to a spot that wouldn’t shine into his bedroom window. Hughes intended to make Vegas’ image upscale and glamorous, saying he thought of Sin City as, “a well-dressed man in a dinner jacket and a beautifully jeweled and furred female getting out of an expensive car.” During his time in Nevada, Hughes retained a small group of advisors nicknamed the “Mormon Mafia,” as many of their members belonged to the Church Of Jesus Christ Of Latter-Day Saints. Since the founding of that religion 185 years ago, Mormons have retained a distinct culture, which includes a subgenre of Mormon cinema, a subgenre of film with Mormon themes and cultural references often virtually unknown to outsiders. We’ll take another trip to the movies next week.